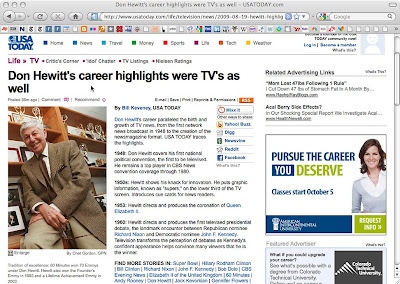 *A portrait I made back in 1995 or so of former 60 MINUTES Executive Producer Don Hewitt appears on the USA Today website. Hewitt’s career as a television news executive spanned more than 50 years, and I remember the portrait assignment like it was it was only a few months ago. Shot on negative film back then. Dragged in a Dyna-Lite two light set set-up early on a Sunday morning into the midtown Manhattan offices of 60 MINUTES and remember bouncing one head into the ceiling with a grid over the strobe head. I remember wanting the consistent small camera apertures at f/11 – f/16 on a slow speed film. (Strobist techniques way before it was even called that.) I still remember bits and pieces about that interview and how pleasant he was with me – even though I was at the early stages of my career. Some assignments will always stick with you. I’m glad that the boys at my old paper in White Plains, NY managed to move this image to Arlington, VA (USA Today’s HQ). Hoping this story makes their print editions as well later today. Boy, this business is really something when you stop and think about it all… -cg. This entry was posted on Thursday, August 20th, 2009 at 7:36 AM. It is filed under Uncategorized and tagged with archive, captions, clips, newspaper, portrait, strobe, strobist, usa today. You can follow any responses to this entry through the RSS 2.0 feed.